In baptism a person becomes part of the family of God, adopted into the family of Christ. Before fonts were used for baptisms the person would be immersed in the water of a river, going under the water completely before being raised out of the river. In this way, baptism mirrored the death and resurrection of Christ. Some churches baptise by total immersion, not in a river but in a pool. At St Laurtence baptism is by pouring water, that has been blessed, over the head of the person being baptised. 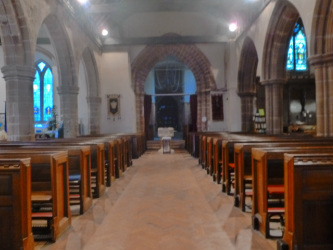 At St Laurence, as in many Anglican churches parents bring their children to be baptised to give thanks for the gift of life and to mark the beginning of the child’s journey of faith and their becoming part of the Body of Christ in the local congregation and as part of the worldwide Christian church. Baptism is a sacrament, celebrated by a priest. When an infant is baptised the parents and Godparents promise to raise child who is baptised in the faith of they church, to teach them about their faith and to come to church regularly as a family. It is normal for at least one of the parents to be confirmed. If the parents or Godparents do not feel able to make this committment a service of thanksgiving for the birth of the child might be possible. The Church of England web site has a great deal of information about infant baptism. Adult baptism has always been an important part of the life as the church as new believers publicly declare their faith in God and are symbolically joined with Christ and his death and resurrection. Usually the baptism takes place after a time of preparation where the adult is taught the basics of the Christian faith and learns what it is to live as a follower of Christ. In the early church baptism was always carried out by a Bishop, at Easter. As the church grew it was not practical for a Bishop to baptise everyone. The Church of England web site has more information about adult baptism and confirmation. Confirmation is separate sacrament celebrated by a Bishop, after a time of preparation. In confirmation those who are confirmed promise to follow Christ for themselves. After they have been confirmed in their faith by the Bishop they take communion (the bread and wine) for the first time. In some cases adults are baptised and confirmed within the service of confirmation (if they were not baptised as an infant).